Nevaeh’s pocket reminds me of the 1960’s tie-dyed patterns I knew as a child. just one recess a day. who was gnibbling the gnose of his gnu. That gnat ain’t done gnothing to you. Where the cows by Bong! And the trees go jibber jabber joo! And you just can’ catch ’em when they do! 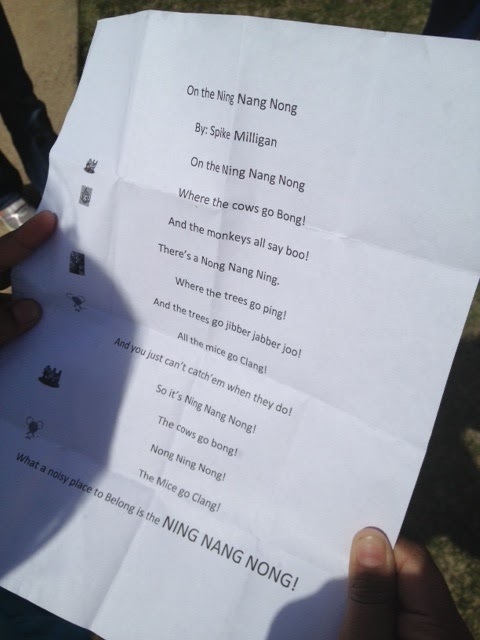 What a noisy place to belong is the NING NANG NONG! The fish cakes could break down the door. The peas are frozen to the box. The salad bar-don’t dare to try it. can bore a hold right through the bowl. The corn could make you lose your hair. The way they cook here is a crime. Hmmm.Now that I sometimes (as little as possible!) eat in a grown-up school cafeteria, things haven't changed all that much, Thanks for my first smile of the day! What a wonderful project! I love the creativity of their pockets and the diversity of their poems. 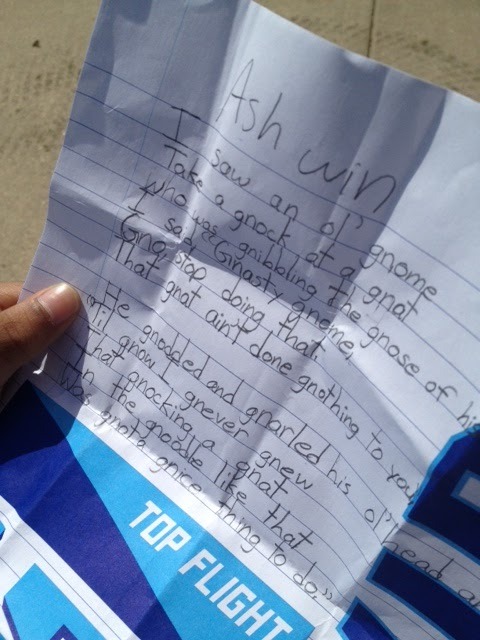 I love this poem project! The pockets shows such creativity and the poems were the best! 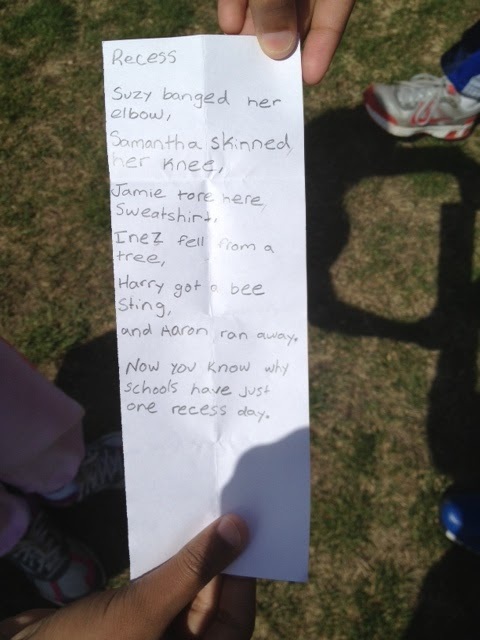 I loved the “Recess” poem – it was my favorite!! Thanks for sharing, Bellezza! Thanks, Kathy. I love giving them free reign and seeing what they come up with! Bellezza, this is such a fun intro to poetry! 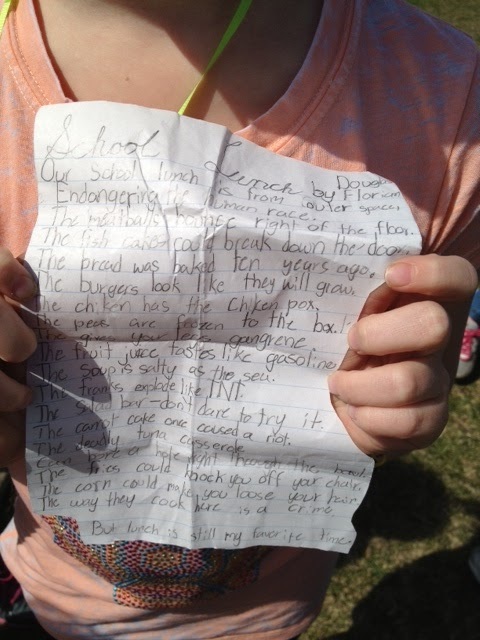 You obviously have many budding poets in your class! What a delight it is to read this post. I've been reading down through your posts, especially liking getting caught up on your son's activities. I'm so glad you were able to see him graduate. I look forward to reading posts when you share his next step. Clearly, you have been dating the wrong kind of women. Have you tried looking in church instead of bars? Beverly, thanks for visiting me and catching up on this journey called parenting with my son and I. Talk about a journey made on one's knees! So glad, Chris, because that's what good days in the classroom should do!